A clumping perennial Arabis, often commonly called ‘rockcress’, makes great rockery plants and ground covers. These are a tough group of low growing plants that are underused in many gardens. The variegated forms are particularly attractive green with pale cream margins or splashes. We have been growing the cultivar, Arabis ferdinandi coburgi ‘Variegata’, pictured right for many years. Maintenance is limited to pruning away a few wayward shoots each summer, otherwise a very well behaved plant in our garden. They do flower in spring, however it is the year round foliage that is the attraction for most gardeners. Grow them near the front of the garden border, or use them in containers to underplant taller shrubs. All Arabis grow well in a humus rich soil. Water arabis well until they are established. A. caucasica ‘Flore Pleno’ – Beautiful white flowers on a great plant. A. caucasica ‘Snowcap – A popular cultivar. 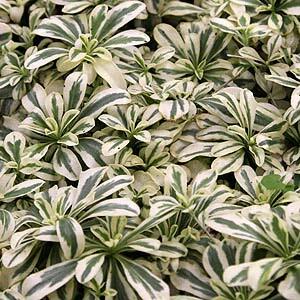 A. procurrens ‘Variegata’ – A variety with lovely foliage and white flowers in spring. A. lucida – This is a low growing rock garden plant reaching only around 15cm, lovely white flowers in early spring.